ACTIVE Take a Castle visit and Hike Tour to Count Dracula’s prison tower in Visegrád. ACTIVE Join an afternoon Guided Hike along the Danube’s Schlögen Oxbow bend that cuts a dramatic landscape made by centuries of natural elements. Enjoy free time on the Sky Deck this afternoon while you sail through the amazing horseshoe bend of the Danube’s Schlögen Oxbow on your return to Linz. Later, enjoy a farewell dinner onboard, followed by live entertainment. Whether you’re an art lover, a foodie, a history buff, or an energetic adventurer, your Active & Discovery cruise on the Danube River invites you to experience culture and cuisine in creative ways that are perfect for you. With Avalon Choice, you can select the experiences that are perfect for your interests and pace—from Active to Discovery to Classic. Avalon Choice gives you a choice of included excursions in each port. Start by ex-ploring Budapest your way—stroll its streets for classic sightseeing with a local guide or take a bike ride through town for a different perspective, or learn something new with a leisurely walking tour to discover a few local Hungarian phrases. Attend a Medieval Knights Tournament at a Visegrád castle, see Gustave Klimt’s renowned “Kiss” painting in Vienna. With Avalon Choice, each day is yours to spend your way. Whether you prefer browsing the art collection of the Habsburg Empire, sipping local vintages at an Austrian wine-tasting, or joining a canoe excursion, your Active & Discovery cruise is packed with Avalon Choice inclusions for every pace in every place we go. Sam-ple cheese and beer made by Trappist monks and explore their Abbey gardens; take a hike to Count Dracu-la’s prison tower; or tour Mauthausen Concentration Camp, one of WWII’s most notorious sites—selecting from an unmatched variety of included excursions to choose from each day. 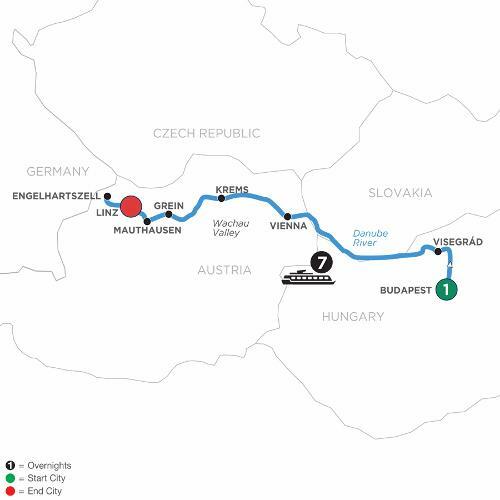 Join us on this Active & Discovery cruise and experience the Blue Danube your way. No matter how you choose to explore new locales—from paddling canoes to picnic views—Avalon Choice includes the excursions and activities to invite you to dis-cover each destination your way. Your Active & Discovery Danube River cruise can be as active or leisurely as you like!